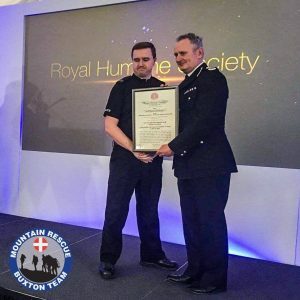 Buxton Mountain Rescue Team Deputy Team Leader Rob, recently received a Royal Humane Society Certificate of Commendation from Derbyshire Constabulary’s Chief Constable. This was following his involvement in a rescue on High Tor in Matlock Bath, last year. Members of the public had contacted the Police after hearing faint cries for help in the High Tor area. Rob, who is a serving Police Officer with Derbyshire Constabulary was deployed to respond to the reports of cries for help. He was able to locate the elderly walker who had fallen some distance off the path and was balanced precariously above a further drop. He remained with the lady, providing reassurance, comfort and care to the lady, whilst initiating a full scale call out of the Mountain Rescue Teams, aware that there was a considerable drop beneath them both. It later transpired that the lady had been stuck in her predicament for about eight hours, and Rob was the first person who was able to provide help. Buxton Mountain Rescue Team and Derby Mountain Rescue Team were called out to the incident, along with Derbyshire Fire & Rescue Service, East Midlands Ambulance Service Hazardous Area Response Team. The Maritime and Coastguard Agency helicopter from Humberside was also requested to assist, in what was becoming a difficult and technical rescue to effect. Due to the nature of the terrain, it was agreed that a technical rope rescue system was the best and safest way to extract the lady from her difficult situation. With all the services working together and through effective team work, a rope rescue system was deployed to bring the casualty safely down to the waiting ambulance. Rob, who has been a Team Member for 9 years, said ”I was pleased that once deployed to the incident, I was able to locate the casualty quickly and provide her with some reassurance, while a comprehensive rescue plan was put into place. It is nice to be recognized for my involvement in this rescue with an award. 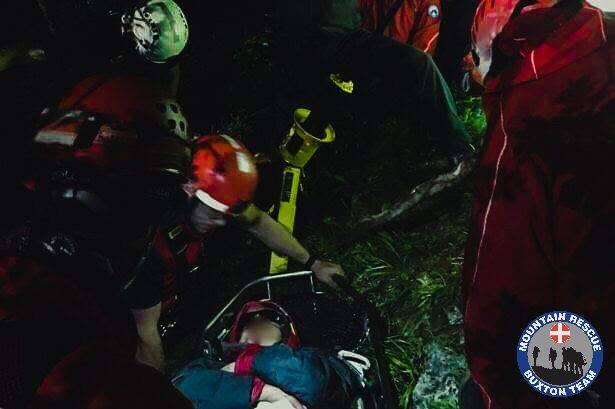 However it’s important to highlight, that this rescue was just one of 179 search and rescue operations carried out, by Derby and Buxton Mountain Rescue Teams last year.